Kevin Troy Faulk (born June 5, 1976) is a former American football running back who spent his entire 13-year professional career playing for the New England Patriots of the National Football League (NFL). He was drafted by the Patriots in the second round of the 1999 NFL Draft. He played college football at Louisiana State University. Dubbed the Patriot's "Swiss Army knife" because of his multitude of tools and versatility, he played a wide variety of roles on the team. Besides his primary position as running back, he also played some as a wide receiver, special teams as a gunner and a return specialist. He was rarely the team's feature back, but was adept at catching the ball, blocking, and running as needed. In 2016, he was inducted into the Patriots Hall of Fame. Born in Lafayette, Louisiana, Faulk attended Carencro High School in Carencro, Louisiana, where he helped his team win the 1992 State Championship (Class 5A). In high school, Faulk rushed for 4,877 yards on 603 carries (8.1 yards per carry). He also had 7,612 all-purpose yards and 89 touchdowns. He was twice chosen as Louisiana's Most Valuable Player (Class 5A). He was also given All-American Honors by USA Today and Parade. Following high school, Faulk attended Louisiana State University, where he immediately became the starting running back for LSU's football team as a true freshman in 1995. In 1996, Faulk was voted to the College Football All-America Team by the Associated Press. On September 7, 1996, in the game against the Houston Cougars, LSU trailed at halftime 34–14. Many LSU fans left Tiger Stadium before the game ended in anticipation of defeat. Faulk, however, took over the game in the second half and rushed for a school record of 246 yards on 21 carries and returned four punts for another 106 yards. The result was an LSU win by one point, 35–34; Houston scored nothing in the second half of the game. Faulk ran for 1,144 yards on 205 carries in 1997, scoring 15 touchdowns. He improved on those numbers as a senior in 1998 when he ran for 1,279 yards on 229 carries and scored 12 rushing touchdowns. He added 287 yards receiving and three receiving touchdowns. Faulk finished his LSU career with 4,557 yards rushing in 41 games, which was second best in SEC history behind Herschel Walker of Georgia (5,259 yards in 34 games). Faulk also finished his career with 6,833 career all-purpose yards and 53 total touchdowns, which tied him for fifth in NCAA history and first in SEC history. His SEC record was surpassed on November 21, 2009 by Tim Tebow of Florida. In 1999, Faulk graduated from LSU with a degree in kinesiology. Faulk was selected by the New England Patriots in the second round (46th overall) of the 1999 NFL Draft. Peter Carroll was the head coach. As a rookie, Faulk started the first two games of the season at running back before an ankle injury kept him out of the next two games. He returned in Week 5 as a reserve behind starter Terry Allen. He suffered a sprained ankle in Week 14 and was placed on injured reserve on December 14, 1999. In 11 games, Faulk recorded 1,358 all-purpose yards and also returned a kickoff for 95 yards against the New York Jets on November 15. He recorded 227 rushing yards on 27 carries and one touchdown, along with 12 receptions for 98 yards and a touchdown. He added 943 kickoff return yards on 39 returns, as well as 10 punt returns for 90 yards. In 2000, Faulk shared a starting role with rookie J. R. Redmond, with Faulk starting 9 of 16 games played. He led the team with 570 yards rushing on 164 carries with four rushing touchdowns. He added 51 catches for 465 yards and one touchdown. He was also active on special teams, leading the team with 38 kickoff returns for 816 yards while also returning six punts for 58 yards. Faulk settled into a reserve role for the 2001 season, behind starter Antowain Smith. He played in 15 games, making one start, and finished second on the team with 169 yards rushing on 41 attempts, with one touchdown. He added 30 receptions for 189 yards and two touchdowns. He also led the team for a third straight season with 33 kickoff returns for 662 yards, while adding four punt returns for 27 yards. On December 22 against the Miami Dolphins, Faulk completed a 23-yard pass to quarterback Tom Brady, his first career pass completion. Faulk and the Patriots would go on to win Super Bowl XXXVI over the St. Louis Rams, who his cousin, fellow running back Marshall Faulk, played for. In 2002, Faulk finished the regular season with 1,440 all-purpose yards in 15 games, all as a reserve behind Smith. He ran 52 times for 271 yards and two touchdowns, caught 37 passes for 379 yards and three touchdowns, returned 26 kickoffs for 725 yards and two touchdowns, and added 8 punt returns for 65 yards. His seven total touchdowns ranked second on the team. He also finished second in the NFL in 2002 with a 27.9-yard kickoff return average. That same year, he broke the Patriots' franchise record for total kickoff return yards, which had previously been held by Dave Meggett, who had 2,561 yards on kickoff returns. Also in 2002, Faulk returned two kickoffs for touchdowns, becoming only the second player in Patriots history to return more than one kickoff for a touchdown in a season. One kickoff return was an 86-yard return against the Oakland Raiders on November 17, the other was an 87-yard kickoff return against the New York Jets on December 22. He became the only player in franchise history and the only NFL player in the 2002 season to record multiple touchdowns in three different categories: rushing, receiving, and kick returns. In 2003, Faulk compiled 1,351 all-purpose yards (including a team-high 1,078 yards from scrimmage) in 15 games, making eight starts in his final season with Smith. He finished the season with career highs of 178 carries for 638 yards as well as 48 receptions for 440 yards. He added 10 kickoff returns for 207 yards and 5 punts returns for 66 yards. Faulk also set a career-high in fumbles in 2003, with four. Faulk and the Patriots finished the season with a league-best 14–2 record, advancing to Super Bowl XXXVIII. Faulk helped the Patriots to a 32–29 victory in the game over the Carolina Panthers with 42 yards rushing and 19 yards receiving. His longest plays were a 23-yard run in the fourth quarter and a two-point conversion score with 2:51 left in the fourth quarter; the direct snap run was the only score by Faulk in 2003. In 2004, Faulk played in 11 games (starting one) as a reserve behind starter Corey Dillon. He recorded 255 yards on 54 carries for two touchdowns, 26 receptions for 248 yards and one touchdown, 4 kickoff returns for 73 yards, and 20 punt returns for 133 yards. The Patriots would again post a 14–2 record and won Super Bowl XXXIX over the Philadelphia Eagles. Faulk played in the first three games of 2005 before suffering a foot injury and not returning until Week 13 in December. In eight games played (two starts), Faulk had 145 yards rushing on 51 carries and 29 catches for 260 yards. He also returned 4 kickoffs for 81 yards. In 2006, Faulk returned healthy to play in 15 games, making one start. He ran 23 times for 123 yards and one touchdown, and also had 43 receptions for 356 yards and two touchdowns. He returned 17 kickoffs for 364 yards and 31 punts for 330 yards. 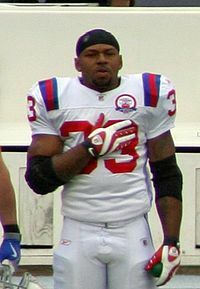 On November 26, 2006, in a game against the Chicago Bears, Faulk surpassed Tony Collins on the Patriots' all-time receiving list for a running back with his 262nd catch. Dillon departed after the 2006 season, leading Faulk to make 8 starts in 16 games played in 2007, alongside second-year running back Laurence Maroney. He was voted an offensive captain for the first time in his career. Faulk rushed for 265 yards on 62 attempts, and added 47 catches for 383 yards and one touchdown. He also returned 2 kickoffs for 47 yards. To start the 2008 season, Faulk was given a one-game suspension for violation of the NFL's substance abuse policy. He was found possessing marijuana while attending a Lil Wayne concert in Louisiana in February 2008. Faulk returned in Week 2 and played in every remaining game, making three starts to mark his tenth consecutive season with the Patriots. He finished the 2008 season with 83 carries for 507 yards and three touchdowns, as well as a career-high 58 receptions for 486 yards and three touchdowns. On special teams, he added 2 kickoff returns for 36 yards and 10 punt returns for 132 yards. In 2009, Faulk started 7 of 15 games, rushing 62 times for 335 yards and two touchdowns, and making 37 catches for 301 yards and one touchdown. He also returned 6 kickoffs for 144 yards and returned 5 punts for 31 yards. During the season, Faulk became the team's all-time leader in all-purpose yards, amassing 12,140 yards by the end of the season. He also became the 26th running back in NFL history with at least 400 receptions. Faulk's 2010 season ended in Week 2, when in the fourth quarter of a loss to the Jets, Faulk tore his ACL while being tackled. In two games, both starts, Faulk had eight carries for 45 yards and six catches for 62 yards. He was placed on injured reserve on September 22, 2010, ending his season. On July 30, 2011, Faulk re-signed with the Patriots. He was placed on the "PUP" list but returned to practice after week six. On October 9, 2012, Kevin Faulk announced his retirement at a ceremony at the Hall at Patriot Place. He currently appears on NESN every Monday and Friday for a game recap and preview respectively. He also appears on The Real Pre-Game Show on WEEI-FM 93.7FM every Sunday at 9am for a 1pm kickoff and Noon for a 4:25pm kickoff. On May 18, 2016, Faulk was elected into the Patriots Hall of Fame, beating Raymond Clayborn and Mike Vrabel in a fan vote. Kevin Faulk is married and has three children. He is a cousin of former NFL running back Marshall Faulk. ^ Brown, Dave (August 1, 2016). "Kevin Faulk enters Patriots Hall of Fame, gets surprise from Tom Brady". Hampshire Gazette. Retrieved November 7, 2018. ^ a b c "Kevin Faulk". New England Patriots. Archived from the original on August 16, 2011. Retrieved July 24, 2012. ^ "Kevin Faulk Draft Profile". NFLDraftScout.com. ^ "Patriots' Faulk suspended 1 game for drug violation". Associated Press. August 30, 2008. Archived from the original on August 31, 2008. Also published by ESPN.com as "League suspends Patriots RB Faulk 1 game for drug infraction"
^ "Pats RB Faulk allegedly busted with pot". Associated Press. February 26, 2008. Archived from the original on February 27, 2008. ^ "Patriots re-sign Kevin Faulk, Sammy Morris; Mankins signs franchise tender". Patriots.com. Retrieved July 30, 2011. ^ "Familiar Faces Return to Patriots Practice". BleacherBumsSports.net. October 19, 2011. Retrieved April 20, 2019. ^ "Kevin Faulk Stats". ESPN Internet Ventures. Retrieved March 7, 2014. ^ "Kevin Faulk elected into Patriots Hall of Fame". New England Patriots. May 18, 2016. Retrieved April 20, 2019. ^ Smith, Michael (September 28, 2003). "Faulk no small factor in Patriots' progress". The Boston Globe. Archived from the original on June 4, 2011. Retrieved November 20, 2013. ^ Cafardo, Nick (September 23, 2000). "Runs in the family: Kevin Faulk emulates cousin". The Boston Globe. Archived from the original on June 2, 2013.